Laura Stein introduces Andrew O’Donnell from Supercharged Stocks: A week ago I was in Vancouver for a week I meet a lovely gentleman by the name of Andrew O’Donnell he spoke to me about a very intriguing area called the Golden Triangle which has captivated my interest, as it has many other people interested in resources for a very long time. Andrew sent me a lot of history and inner thoughts, here are some for our readers, I hope you enjoy them! We are being raised up upon a swell, a rising tide of excitement around a historical region in Northwest Canada an area with a pioneer spirit and deeply rich mining history that has captured our imagination. We are standing ahead of the curve, with our attention focused back to this opportunity in our own backyard. Canada is a resource-based country in which one sector; mining has been stalled for years. But a new cycle is just starting: Fundamental and technical data suggests an early groundswell of investment interest in this foundational sector of the economy. Cycles are that, cyclical and this undervalued sector is poised to rebound. At the same time, drivers such as fundamental value, price mismatch and discovery potential are pointing to future growth. We will explore the history of this area; the incredible discoveries and why this pocket of the world is where big players are investing smart money, and why you need to be involved. Northwestern BC is as rugged as it is beautiful and replete with stories of the Gold Rush. The history of this area begins before Canada was even a country with pioneering, adventurous, determined, gritty people putting everything at risk to chase a dream. That rush began back in 1861, when Alexander “Buck” Choquette struck gold where the Stikine and Anuk Rivers meet. This discovery began the Stikine Gold Rush where it is estimated more than 800 prospectors left Victoria in search of gold. A few years later, another rush for gold welled up in the Cassiar region – it’s where British Columbia’s biggest ever gold nugget, weighing in at 73 ounces, was discovered. The Atlin Gold Rush, an offshoot of the world Famous ‘Klondike Gold Rush’, would also occur just north of the Golden Triangle. In 1861 the Stikine gold rush was the first to see the migration of hearty men. But it was remote. Make no mistake: That was no small feat of travel, and not an easy life. There was little to no infrastructure and the capital outlay to get started would cause any company to hesitate. It is a monumental feat to develop the necessities to make mining possible. This life was tough for these early pioneers; many looked upon the glaciers, but could not know what riches might lay beneath the ice. The mining season would have been incredibly short back then, with the first big results delivered by Premier Gold Company in 1918. Premier was to become one of the greatest mines in the world at that time. Despite a number of key discoveries, some of the Triangle’s treasures remained elusive—locked under sheets of snow and glacier. Recently, that ice has receding and now reveals exciting exploration opportunities. The quickening pace has begun with a rush of blood into the hearts of those who understand the need for massive mineral discoveries. During the preceding quiet period, only a handful of people were working arduously at positioning themselves for greatness. A golden dawn has arrived and humble, hard-working prospectors are ready to reap the rewards. A long time has passed since men with pick axes, and gold pans sifted through streams and rivers. Some gold was found at surface or in creek beds but the majority is, of course underground. Hydraulic and placer mining techniques, including dredges were used from 1910-1950. Of course getting equipment up to sites was extremely difficult, and seasonal to say the least. Digging through permafrost was of course exhausting. However the stiff ground made small shafts and adits more stable. Time passed until the Snip deposit was discovered in 1964 by Cominco, yet the mine was not developed until 1986. In the end, the Snip Mine produced a tidy sum of 1 million ounces of gold from 1991 to 1999 at an average grade of 27.2g/t. In 1988 the region began to heat up, again. After drilling 109 holes two junior mining companies, Stikine Resources and Calpine Resources found the discovery at Eskay Creek to ignite the area: 27.2g/t Au and 30.2g/t Ag over 208 meters. The move back to this region was not in question. Key factors required to position growth were strong gold prices, growth of expenditure in infrastructure, and naturally, some discoveries to encourage money to come back. Completion of a $700 million high-voltage transmission line to the Golden Triangle has now lights the path to future exploration success: The Northwest Transmission Line goes 335km from Terrace to Bob Quinn Lake, and north to the Red Chris mine. Roads are being paved and new ocean port facilities for export of concentrate are rapidly developing in Stewart. The latest addition is a three dam, 277 MW hydroelectric facilities located 70km northwest of Stewart. In all, the Canadian government is going to spend an astounding $180 billion. Yes, $180 billion. Both the Canadian federal government and Province of British Columbia have announced combined investment of over $4.1 billion doled out over the next decade for transit, green infrastructure, recreation facilities, and projects in rural and northern communities across the province. But this money was not exclusively for mining, but to also support a LNG pipeline for oil and gas. This said, both sectors stand to benefit incredibly. Resources that many technicians know are sitting in the earth are now becoming feasible with infrastructure being brought so close to potential discoveries and past producing mines. A massive build-out of infrastructure will soon run right through the most prospective areas for mineral exploration. Or perhaps it was Bob Quartermain, CEO of Pretium Resources who discovered a bonanza hole of our mineralized gold bands with incredible grades and a 33,000m in 2009/10 in the Valley of the Kings. At 8.1 million ounces graded 16.1 grams per tonne, Pretium’s Brucejack deposit had some of the richest ore in the world. This mine is close to the Alaskan panhandle and 65km north of Stewart, BC. In the south tail of the Golden Triangle, momentum is building for Juggernaut Exploration, which has any technical experts and industry heavyweights saying that Juggernaut’s Empire Property is giving more than just early indications that they could be onto the next big mining camp in BC, similar to having Seabridge’s KSM deposit, Pretium’s Bruce Jack deposit and Eskay Creek-style VMS, all under the umbrella of one company. This is an astonishing possibility but those are the whispers at this time. Should these rumours come true, the results will be incredible to present. 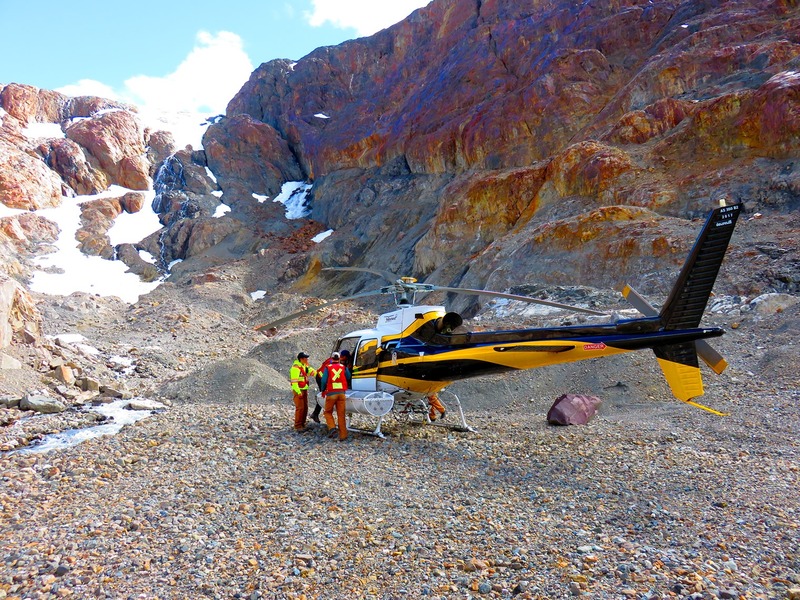 NovaGold and Teck Resources joint venture at Galore Creek and GoldStrike Resources joint venture with Newmont Mining at the Plateau property are two other notable active potentialities. On July 26, 2018 Newmont Mining bought out NovaGold for $275 million for their stake in the Galore Creek project. Behind both Juggernaut and Goldstrike, you will find the same dedicated core group of people, who built and negotiated GoldStrike’s $52 million deal with Newmont Mining. If they can pull off a deal of this calibre in the Yukon, it stands to reason they’ll be just as sharp makings deals between Juggernaut and any potential major producers. could provide you with astounding returns. In a trough for 6 years. The retail market and mainstream news is not paying attention. Underpriced and undervalued opportunities at every turn. One final but important distinction for this region is relationships with First Nations Peoples. Successful relationships with indigenous people in any jurisdiction require a thoughtful approach and deep respect. Unfortunately, this hasn’t always been the case, and we as a society have much work to do to make things right. With that in mind, all the evidence and my own personal experience shows me First Nations support for responsible mining is high. Employment can be scarce in the remote areas reserved for Native peoples and the mineral exploration and development industry can provide both desperately needed infrastructure and a number of good-paying technical jobs and skilled jobs. Indeed, Pretium’s Brucejack mine was built in relatively short order due to support from the Tahltan and Nisga’a nations. Both signed cooperation and benefits agreement with Pretium, which was able to put the mine into operation just two years after it received its environmental certificate. This alone makes investment in stable Canada exceptional when these factors are handled appropriately. It is time for people to pay more attention to their portfolios, to ask if they are over committed to specific sectors. Most people are in passively invested funds which are great for the most part, assuming these funds are not just all buying the same few stocks. This summer the Golden Triangle is being drilled by many companies and there are large producers, knowledgeable geologists, keen investors and major institutions watching with keen interest. This region is known to have huge upside potential and massive infrastructure is being built to meet expected discoveries and world demand. Do yourself a favour and talk to an advisor, send me a message or keep reading about what mining does and be interested in this market. This is an undervalued sector, in a supported region with great infrastructure and government regulations that is ready to meet the voracious world appetite for minerals and metals. Do not miss out on getting ahead of the curve. This is the time, this is the second pick and get ready to hear more about this amazing opportunity. Go to our web site superchargestocks.com for Prospectors Corner prospects, our Picks Ahead of the Curve Made the Grade. Edited by Liam Hardy for MiningIR.com. MiningIR host a variety of articles from a range of sources, our content, while interesting, should not be considered as formal financial advice. Always seek professional guidance before investing.